Just finished the saxon tales and need a new series. Big fan of historical fiction and science fiction. Really enjoyed the red rising series and chaos walking. James Clavells Asian Saga for historical fiction. Shogun was phenomenal. Rememberance of Earths Past (Three Body Problem) trilogy for sci-fi. I’m halfway through the last book and it’s been fantastic. I've heard a little about three body problem, will check it out. I’m in the middle of The Expanse and really like it. I’m with rebelrouser. It’s hard to put into words just how awesome Harry Paggett Flashman is. Saxon Stories were/are great! See the series, The Last Kingdom btw. Have you read The Foundation Trilogy? Of course you have. Okay, so, for something a little different try The Warlord Chronicles, or Trilogy. Those simply add to the list of great suggestions already mentioned above. Patrick O’Brian’s Aubrey/Maturin series, early nineteenth century English naval histories and very well written. 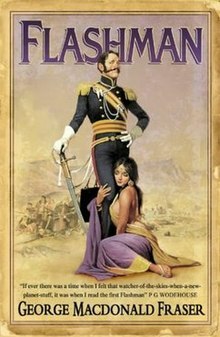 George Macdonald Frasier’s Flashman series. Witty and very entertaining. Mid-nineteenth century English international military and colonial ripping yarns. Brigadier-General Sir Harry Paget Flashman VC KCB KCIE is a fictional character created by George MacDonald Fraser, but based on the character "Flashman" in Tom Brown's Schooldays (1857), a semi-autobiographical work by Thomas Hughes. In Hughes' book, Flashman is the notorious bully of Rugby School who persecutes Tom Brown, and who is finally expelled for drunkenness. Twentieth century author George MacDonald Fraser had the idea of writing Flashman's memoirs, in which the school bully would be identified with an "illustrious Victorian soldier": experiencing many 19th century wars and adventures and rising to high rank in British army, acclaimed as a great soldier, while remaining by his unapologetic self-description "a scoundrel, a liar, a cheat, a thief, a coward—and oh yes, a toady." 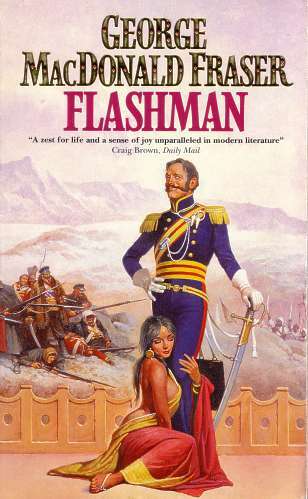 Fraser's Flashman is an antihero who runs from danger or hides cowering in fear, betrays or abandons acquaintances at at the slightest incentive, bullies and beats servants with gusto, beds every available woman, carries off any loot he can grab, gambles and boozes enthusiastically, and yet, through a combination of luck and cunning, ends each volume acclaimed as a hero. The books are like James Bond set in the 19th century -- and hilarious to boot. Flashman experiences (always against his will) The Charge Of The Light Brigade (which he somehow ends up leading! ), The Sepoy Mutiny, the Taiping Rebellion, Little Big Horn and other great moments of history, all the while getting mixed up with Queen Victoria, Bismarck, Wild Bill Hickok, Lola Montez, Lincoln, The Empress of China, Oscar Wilde, John Brown the abolitionist and other such immortal personages. My favorite book in the series is the third, Flash For Freedom (which takes place in pre-Civil War NO and Mississippi), but I'd start out with the first, Flashman. After that you can really read them in any order. There are 12 books in the series; I reread them every 4 or 5 years. For science fiction types - the Zombie Fallout series by Mark Tufo. Great reads. Or the Shrouded World series by Mark Tufo and John O'Brien.